Esta engañosa departamento de dos dormitorios está situado en el centro de la ciudad. Cerca de Cairns Central Shopping. Pero en una calle muy tranquila. propiedad amueblada completa con aire acondicionado, armarios empotrados, salón de azulejos, pisos laminados en las habitaciones. lavandería Enquiped. El apartamento tiene muy grande salón de 102 metros cuadrados. Balcón con vistas montaña. Damos la bienvenida a todo el viajero genuino por todas partes en el mundo. This is a comfortable spacious apartment 5 minutes drive or 20 minute walk from all the attractions of the centre of town such as the casino, convention centre, wharf and esplanade; yet far enough away from it all to be quiet and relaxing. If attending an event at the Cairns showgrounds it would be excellent location as the main gate is less than 5 minutes walk away. Cairns Central shopping centre and railway station are only a couple of minutes drive or a short 10 minute walk away. Located on the third storey of the building you are presented with excellent uninterrupted views of the surrounding mountains to the south west, what more could you ask for while relaxing on the balcony with a cool drink and nibbles after a hectic day of activity. Everything you need to be comfortable is waiting. Ceiling fans and reverse cycle air-conditioning in both bedrooms and the lounge will keep you comfortable all year round. The kitchen has all the cooking utensils needed to self-cater to keep meal costs down, all you need to do is add food. For those that most get their online fix the Wi-Fi is fast and reliable. The bathroom has a European laundry with wash tub, washer and seperate dryer for those making a longer stay, although the dryer should only be necessary on the rare occasion that Cairns is cold as their ample hanging space provided on the balcony to air dry clothing, in Cairns' climate this is faster than any dryer and more environmentally friendly anyway. The swimming pool looked inviting, unfortunately our purpose for being in Cairns did not allow use to enjoy this facility. Undercover parking is conveniently provided with one space being allocated to the apartment and clearly marked. Finally the owner is very responsive and courteous to all enquires making the whole experience hassle free and re-assuring. 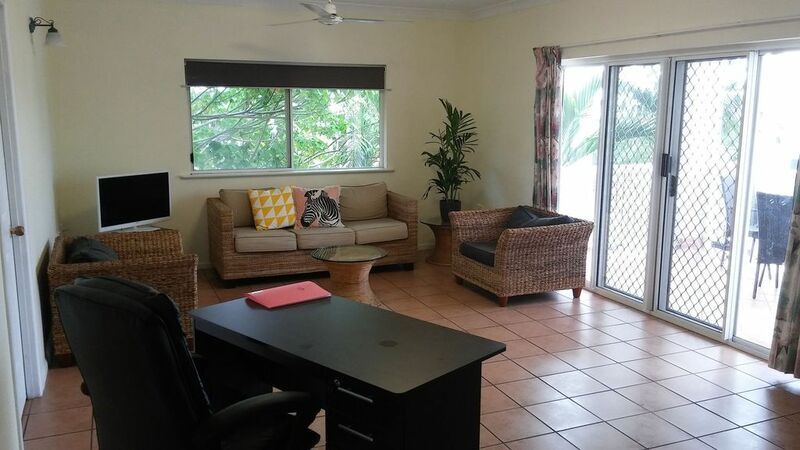 If you are looking for convenient, value for money, self-contained apartment accomodation in Cairns you have found it, don't bother looking any further. We had a lovely stay. The apartment is spacious, comfortable, clean and has all you need. There are plenty of racks to hang up wet bathers and towels. The little pool at the back is just right. Walking into the city centre / to the lagoon is a comfortable 20 minutes walk and the big shopping centre is only 10 mins away. The owner is friendly and helpful. We would go back there again!